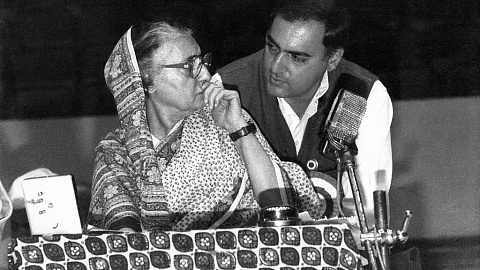 कैसे राजीव गाँधी राजनीती में आएं? It was an awesome time reading all the entries of the ‘Empire’ writing contest, and choosing is always hard, as talent is everywhere! But after great deliberation, our judges have finally settled upon one entry which triumphed over all the others to rise as the winning entry of the contest. 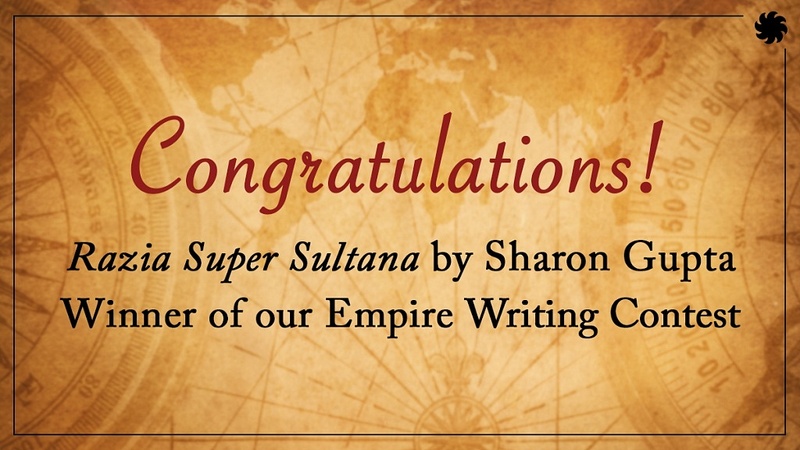 The winning entry is Razia Super Sultana by Sharon Gupta. Editor’s note: History is often silent about women. 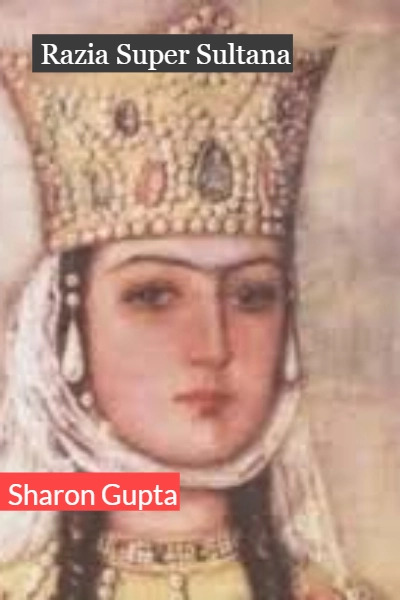 It was refreshing to have a short story on a female historic figure, especially one who is not heard about much — Razia Sultana, the only female ruler to have reigned over the Delhi Sultanate. Razia’s character comes alive with wit and charm. What kind of woman would it have taken to rule over the Sultanate? And how have we not been curious about such a fascinating character? Read the winning entry here. Juggernaut had a little tete-a-tete with Sharon about her story and her passion for writing. Your story is the winning entry of the contest. Please tell us more about it, and its inspiration. Answer: I’ve always been fascinated with Razia Sultana. A woman ruler in medieval times! She predates Queen Elizabeth I and Queen Isabella of Spain. I studied English Literature but I love History, too. My novel, The Shakespeare Murders, which was published in October last year, is a historical fiction thriller. This entry, Razia Super Sultana, enabled me to combine my love of history with the amazing Razia and present the two in a humorous way. Do you have any particular rules or rituals you follow as a writer? Answer: I’m a Civil Servant with twenty-four years’ experience in the Government and I’m a wife and mom, too. So, as you can imagine, time management is all important. I do long for peace and quiet in which to write but since I rarely get that, my only ritual or rule to begin writing, is taking a deep breath and visualizing a retreat into my ‘mind palace’, a la Sherlock Holmes. Then I pick up a pen and write. My first two drafts are always by hand. Then I get on the laptop. What got you interested in becoming a writer? Where do you go for inspiration? Answer: Mysteries and thrillers grabbed my interest from a very young age. I wrote my first story at the age of ten. Since then, I wanted to become a writer, a professional author so that people would read my works. I don’t need to seek inspiration; I find it everywhere, at work, at home, in my interaction with the people I meet every day. Human beings are very interesting creatures if you pay attention. What’s that one piece written by you which is your all time favourite? Ah, this is a hard one, because I’m always excited about my next work. Don’t look back much. The Red Ink Literary Agency, which represents me, has a few of my unpublished works. Some of those are my favourites. But, since they aren’t in the market yet, I will say my novel, The Shakespeare Murders, which is currently available in stores, is my all time favourite. Your bestselling authors and books list. Why do they make it to your list? This list is really long. I read all the time! Always carry a book in my bag and I use every spare moment to read or jot down points for my next novel. I’ll try and zero in on a few authors. Number One: my all-time favourite is Shakespeare. I actually read the Bard for pleasure. I love Hamlet, Macbeth, Antony & Cleopatra and The Tempest the most. The rest are in no particular order. I’m a big fan of Ian Rankin, Mark Billingham, Stephen Booth, Lee Child, Stanley Kernick and Oliver Harris. Ian Rankin’s Rebus series; Lee Child’s Jack Reacher series; Stanley Kernick’s Relentless (my favourite among his others) and Oliver Harris’ The Hollow Man stand out. All of them are thrillers or Police procedurals. They make it to my list because of the exciting way they depict characters under pressure; because of their snappy and terse writing styles (although Stephen Booth’s style is slower and more laidback); and because of their great plotlines which, I believe, is all important to a novel. Any writing tips you’d like to share with fellow writers? Yes. Never give up! I struggled for years to get a break with a traditional publisher. I was published many times in newspapers and magazines. Five of my short write-ups made it to The Times of India’s Middles! You can find them on my website: www.sharongupta.com and my blog: sharonwriter.blogspot.in. I self-published a novel, too, but it was only after Red Ink signed me on that I got my big break as a writer. So, please keep writing and try and find an agent. Don’t give up…until you’re too old to hold a pen! Sharon Gupta is a Civil Servant and a writer based in Chandigarh. Her Elizabethan thriller, The Shakespeare Murders, is available in bookstores and on Amazon. Her short thrillers are online: Jaipur Estate on freeditorial.com and Gods on Speed, on wattpad.com. Please visit her at www.sharongupta.com and sharonwriter.blogspot.com. Sharon is represented by the Red Ink Literary Agency.